There are times with each new advancement in technology that completely surprise you in many different ways. A few key points for me would be going from an iPhone 3GS to iPhone 4, a Macbook Air to Macbook with Retina Display, and now a 23″ 1080p monitor to a 28″ 4K monitor. When you’ve become accustomed to seeing a certain image, it hits you hard when something different comes along and sets a whole new expectation. Samsung introduced the U28D590 at $699, but it was quickly lowered by $100 not long after launch. As it’s still a new model, stock is limited at most retailers and I had to make my purchase online. The delivery was delayed, but it was worth the wait once it arrived. After I got it set up, I noticed that the resolution was locked at 2560×1440. Even through displayport, my video card couldn’t handle the monitor’s native 3840x2160p display size. I tried playing around in the settings, but it eventually became clear it was hardware locked and not something that could be changed. Determined to take full advantage of what this monitor is capable of, I went out and upgraded my video card. My system previously hosted the Asus Radeon HD6850, a 1GB DDR5 card clocked in at 790mhz. 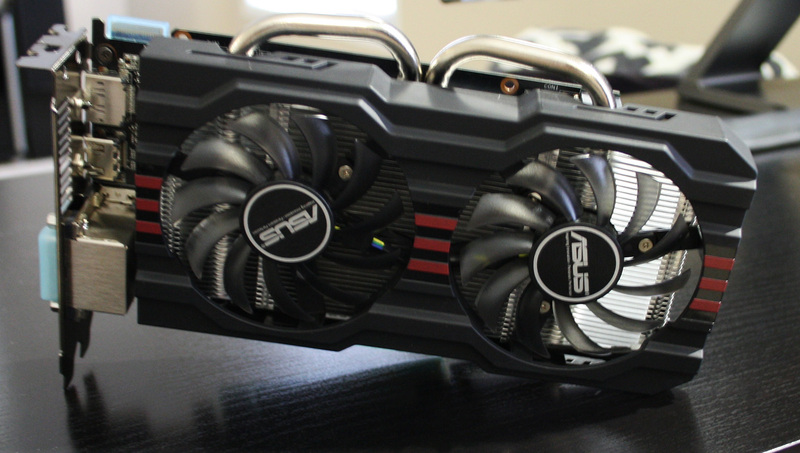 I decided to go with the Asus Radeon R7 260x, upgrading to 2GB and 1.1GHz. I’ve adjusted the settings this time around, overclocking it to 1.7GHz, and got Diablo 3 up to 4k with high graphics settings. Once I installed the new card and reconnected the display, everything changed. Initially, Windows didn’t scale the resolution properly. I had to update the AMD Catalyst Command Center and it’s drivers to reconfigure the display and have everything scale to a normal setting. After everything finished setting up, I was ready to start having fun. A wonderful start to the new generation of quality. The display is by far the highlight of this monitor. Featuring a native resolution of 3840×2160, or 4K, it is 4x the pixels of 1080p. With a 1ms response time and over a billion colours, the Samsung 4K display quality is unmatched in it’s category. More than 8 million pixels fill the screen to give all of your content a life-like visual experience. I have two demo screen shots uploaded in full resolution, available here and here. 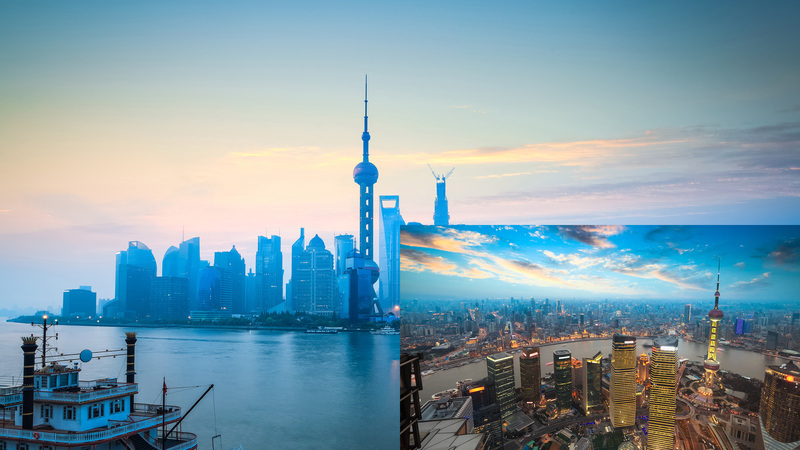 The first is a comparison between the wallpapers I had set for my old 23″ 1080p display to the new 4K display. You can see that it takes up exactly 25% of the screen. 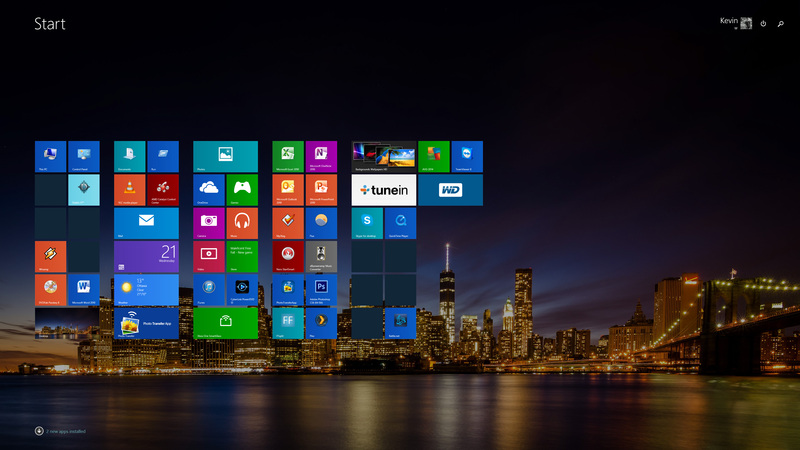 The Windows 8 Start Screen is in the second image, showing how the bigger resolution provides the user easier access to a large canvas of apps. I started by opening a full HD Blu-Ray video, and it ran in one corner of the screen. When I set it to full screen, the detail was noticeably different. It would be similar to playing a DVD on a 1080p television. YouTube was my first search for native 4K content. I loaded up a 4K demo video and adjusted the resolution. While the video did look stunning, some compression was still noticeable. It may be a little while before studio quality native 4K content is available, so for now I’ll have to rely on user generated content. Mobile devices such as Go Pro and the Sony Xperia Z2 are able to record in 4K. The true power of this monitor will come out when uncompressed studio content in native 4K is available either from a disc or download source. After doing some searching, I was able to find a UHD version of the Captain American: Winter Soldier trailer, and LG Demo Content from their retail store disc. The trailer looked great, even though it was still only 3368×1536 and compressed. The LG Demo Content was in full 4K, and looked absolutely incredible. Detail in landscapes and throughout city scenes was colourful and crystal clear. In the package there are a few short videos exploring different areas. This was the kind of content that makes me look forward to the future of video. The next test I was looking forward to running involved gaming. The only game I currently play on PC is Diablo 3, and luckily it was supported. When I first loaded the game, it was still set to 1080p and the difference was very noticeable. I maxed out the settings, and hit apply. The results were remarkable. Everything from character models to the UI felt like a complete overhaul. I had to play with the texture settings to get the right fit, as pushing out 4K was no easy feat even for my new video card. It’s been tough adjusting to the size of the display, so I found that running it in a window actually helps a bit. 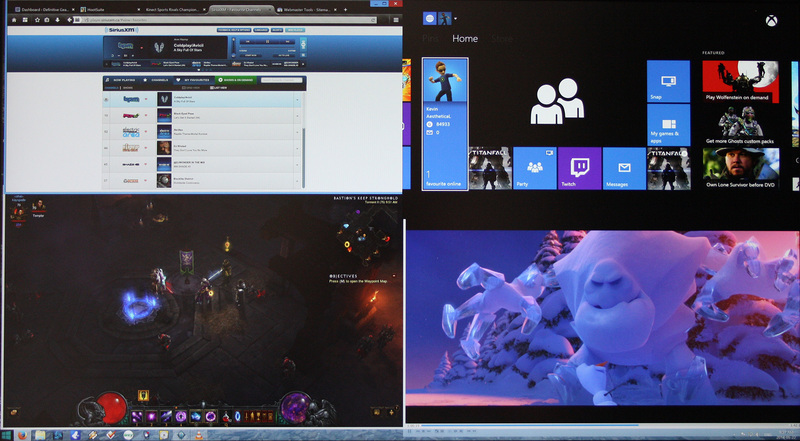 This also allows me to have other windows open simultaneously on the side opposed to using my secondary monitor. The final test I had lined up was photo editing. Manipulating high resolution photos can be done on a 1080p display, but it really excels in 4k. Not only is there more space to work, but the colour reproduction is unlike anything seen before. The editing efficiency was increased significantly as it doesn’t require as much panning and zooming to access each area of a photo to edit. Unless you’re working with extremely high megapixel images, everything can easily be seen at once. Premium design for a premium display. The monitor came out of the box in 3 separate parts. Two screws are built into the pedestal, so there are no chances of them getting lost or misplaced. The base connects to a neck piece, which slides into the back of the monitor. Overall it only took a few minutes until it was set up. 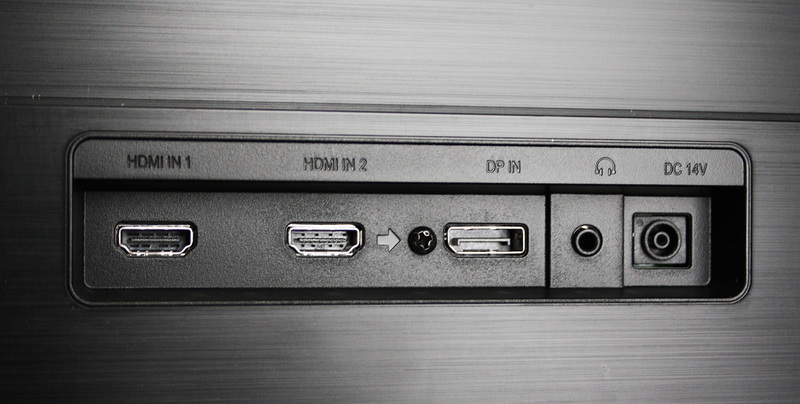 On the back of the display there are two HDMI ports, one displayport, a 3.5mm auxiliary port, and power. The bezel is very thin, making the screen seem larger than it is. Everything from the frame to the base of the unit has a premium feel in the materials that were used. The only downside I have with this model is the stand isn’t adjustable. The monitor appears to slant upwards, and my chair is positioned lower to accommodate my desk. Unless I’m positioned further away, I feel like I have to look up to see the centre of the screen. 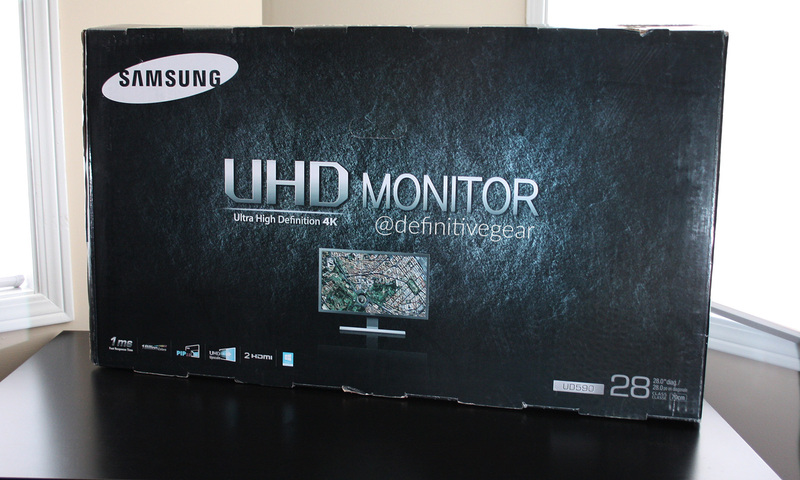 Samsung includes both an HDMI and displayport cable in the box, which was a great addition. Since displayport is the only connection that currently supports 4k at 60Hz, it was the option I chose to go with. I’ve never used displayport before, so the bundled cable was appreciated. An entirely new meaning to ‘multitasking’. One intriguing feature listed on the website was PIP. For those who don’t know, it stands for picture in picture. It’s a feature that has for the most part disappeared in the last decade or so. With the content currently available matching the native resolution of the TV (eg. Blu-Ray in 1080p on a 1080p TV), having video scaled down in a corner of the TV hasn’t been possible. With a 4K display, having 4 1080p streams running simultaneously is no longer a challenge. 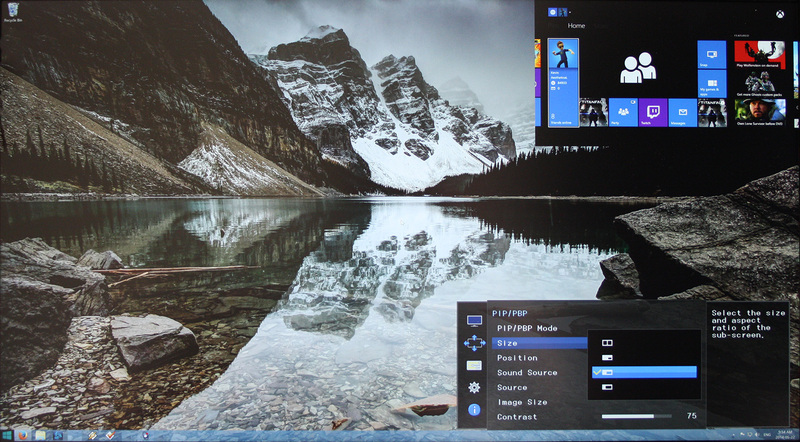 Using either of the HDMI inputs, the monitor is able to bring one of them in via PIP and display it on the screen. There are a wealth of options available for customization including size, position, and scale. The PIP options are also accessible from the main menu. In the picture above, I have an Xbox One connected via HDMI and selected as the PIP source. 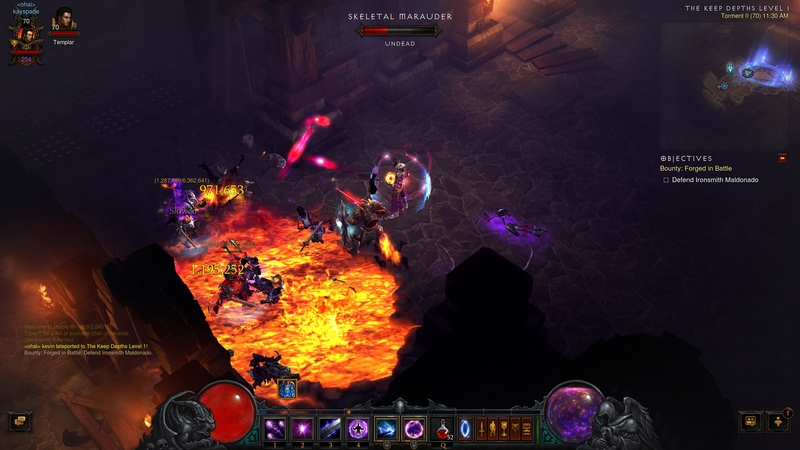 I also opened a Blu-Ray in full HD, and put Diablo 3 in a window at 1080p. Firefox was resized to fit the rest, filling out the rest of the screen. This highlights just how much you’re able to fit inside the real estate provided by this display. It was really impressive to see 4 1080p streams running simultaneously. While this feature isn’t something that would be used consistently, it’s by far one of the best additions. For those who might not have a separate TV, the ability to connect an external HDMI device and use it either as the main screen or within PIP is a huge selling point. Once native 4K content is available for the Xbox One I’ll be connecting it to this display to try out. After using this monitor for a few days, I’ve even come to the conclusion that I don’t need a secondary display anymore. I previously had two set up to assist in managing open windows while doing work, but with the discovery of PIP and window management, there’s enough room on the screen to complete any task efficiently. Getting a monitor as my first 4K device wasn’t planned, but I’m extremely happy with it. With the rumours of Plasma not being able to support 4K resolutions, I’m going to try and hold onto my current set as long as possible until a better option compared to LED is available. Although it did require some configuration to get things just right, plus a new video card, the end result is well worth it. My last monitor provided nearly 5 years of enjoyment, and I can definitely see this one doing the same if not better. 4K is finally here, and I can’t wait to start getting the most out of it.